An analysis released in 2013 by the Washington Policy Center (WPC) and the Beacon Hill Institute (BHI), claimed that by the year 2020, Initiative 937, the Energy Independence Act, passed by voters in 2006, would cost Washington electricity customers more than a billion dollars annually and cause the loss of thousands of jobs. But, 12 years after passage of I-937, which includes standards for the use of new renewable resources and energy efficiency, we don’t have to rely on inferences and models to assess the law’s economic impact. We have actual data from the Energy Information Administration (EIA)1. Here’s how the real figures compare to the WPC/BHI predictions. The WPC/BHI study2 said that by the year 2020, the renewable portfolio standard (RPS) portion would cost Washingtonians more than $1.2 billion annually. While it is difficult to predict what would have happened in the absence of that policy, we know that between 2006 and 2017, after adjusting for inflation and population growth, the cost of electricity in Washington has only increased by $182 million, less than one-sixth the amount predicted by the study. And this is the total increase, which takes into account a multitude of factors. 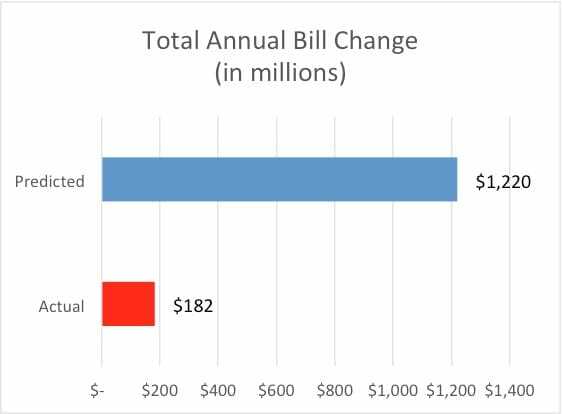 In fact, were we to control for other factors such as increased capital expenditures for infrastructure upgrades and maintenance and reduced revenue from sales of power outside the region, it is likely that electricity costs have actually declined under I-937. In 2006, when I-937 was passed by voters, Washington’s total average retail electric rate was the seventh lowest in the nation. Under I-937 utility prices rose so modestly that by 2013 Washington had the lowest total average retail electric rate among the states and, ever since, has been ranked either number one or number two, where we now sit. Washington maintained and even improved its standing as a low-cost energy provider while relying significantly on clean electricity. The study said that by 2020, the average annual residential bill would go up by $170, commercial by $1,135, and industrial by $13,225. In fact, residential customers have seen a $114 increase. But, commercial customers have seen a slight decrease and industrial customers have seen their adjusted annual costs drop by nearly 12%. Because the costs of Washington’s Energy Independence Act are small and employers’ net energy costs declined, the study’s inference that I-937 is costing the state thousands of jobs is either wildly exaggerated or simply wrong. At the same time, a 2018 study of energy employment3 in Washington, commissioned by the National Association of State Energy Officials, finds that the state’s clean energy economy is providing tens of thousands of jobs. Energy efficiency, a key element of I-937, provides over 60,000 jobs in Washington. And, according to the Washington Department of Commerce4, utility-based energy efficiency programs saved over 900,000 MWh of energy in 2017, which translates to almost $70 million in customer savings. Solar and wind power generation provided another 8,500 jobs and hydro an additional 2,400. In all, clean energy provides more than two-thirds of all Washington energy jobs. These figures do not include indirect or induced jobs, which, according to the Northwest Energy Efficiency Council, would add thousands more. The WPC/BHI study also predicted the effect of I-937 on greenhouse gas emissions. It concluded that CO2 emissions would be reduced by 1.2 million metric tons in 2020. 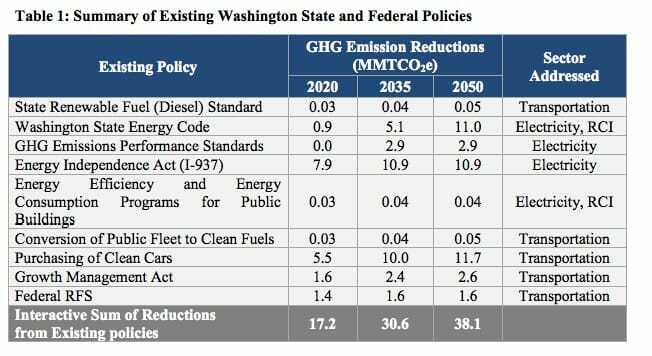 However, in 2013 the Governor’s office commissioned the consulting firm Leidos to examine the issue and that analysis found that I-937 would reduce CO2 emissions by 7.9 million metric tons in the year 2020 making it Washington’s most effective state or federal policy tool for reducing greenhouse gas emissions—and 650% more effective than the WPC/BHI study predicted. The Leidos report5 also found that I-937 would continue to play a major role in cutting emissions through the year 2050. By demonstrating that good energy policy is also good economic and environmental policy, I-937’s energy efficiency and renewable energy standards provide a solid foundation upon which policymakers can build as Washington transitions to the cleanest possible electric system. “Electric Sales, Revenue, and Average Price”, Data Tables, U.S. Energy Information Administration. “The Economic Impact of Washington State’s Renewable Portfolio Standard”, Beacon Hill Institute and Washington Policy Center, April 2013. “Energy Employment By State”, usenergyjobs.org, May 2018. “EIA Reporting, 2018 EIA Utility Reports”, Washington Department of Commerce. “Evaluation of Approaches to Reduce Greenhouse Gas Emissions in Washington State – Final Report”, Leidos, October 2013.